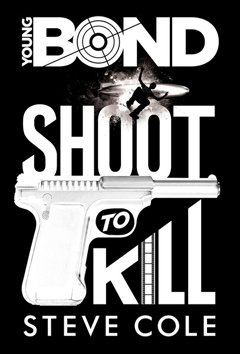 Shoot To Kill, the new Young Bond book by Steve Cole, is published by Random House Children’s Publishers today and available to order now on Amazon.co.uk. This is the first new Young Bond novel since Charlie Higson’s By Royal Command in 2008. The story continues where the series left off, and sees young James Bond discover some dark secrets behind the bright lights of Hollywood. Steve Cole got the ball rolling this morning with a launch event at the London Film Museum’s ‘Bond In Motion’ exhibition, and has now set off on his ‘Bond Voyage’ tour around the country, visiting schools and bookshops. You can book tickets to see him at the Stream 2014 Literary Festival on Saturday 8th November. To find out more about Shoot To Kill and the Young Bond series, visit www.youngbond.com. Order Shoot To Kill hardcover on Amazon.co.uk (£6) or get the Kindle or hardcover version on Amazon.com. Did Bond wear $240 "shorts" or $300 cotton short sleeved shirts on the salary of a civil servant?